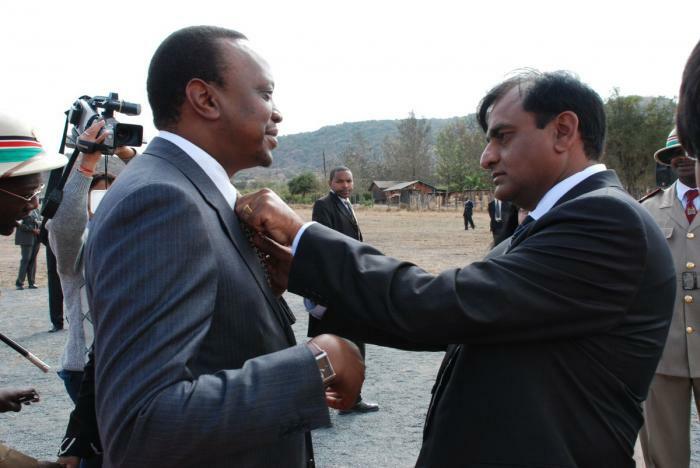 Wednesday April 3, 2019-Kenyan billionaire, Narendra Raval, has shocked the entire nation after his appointment as a Vice Chancellor of Egerton University by President Uhuru Kenyatta. Narendra revealed that he will work at his new post as a University Chancellor for free and instead channel his entire salary towards helping needy students at the institution. He further revealed that he would spend any other allowances he would receive at the institution towards funding the education of the needy students. He vowed that none of his companies would supply materials to the institution unless they were free. Raval has vast properties that span five sectors including Aviation and Steel processing. Some of his companies include Devki Steel Mills Limited, National Cement Company Limited (Simba Cement) and Maisha Mabati Mills Ltd.
Raval, who is a billionaire, was featured on Forbes Africa's Richest list in 2015, was appointed by Uhuru as the Vice Chancellor of Egerton University in March this year. who has been assisting before the appointment! some move as as useless as stated. Never look a gift horse in the mouth. PR or not, if the move is going to assist some poor students access education, good! Wewe hapo juu, pangángá tupu! Umesaidia wangapi? Kudos VC! May more billies emulate your giving heart.